Lawrie Wallace’s early career was in teaching. Eventually he was persuaded to join the provincial government’s service, where he truly distinguished himself. He dedicated his life to public service. As deputy provincial secretary and deputy minister to two premiers, Mr. Wallace organized seemingly flawless Royal visits to British Columbia and worked tirelessly over two decades to enhance British Columbia’s communities. The success of major Centennial celebrations in British Columbia between 1958 and 1971, events which made major contributions to communities throughout this province, was due, for the most part, to the unflagging efforts of their chairman, Lawrie Wallace. In the late 1970s, as B.C.’s Agent General in the United Kingdom and Europe, Lawrie Wallace became known as “Mr. B.C.”: they made him a Freeman of London. Even in his retirement, Lawrie Wallace has been assisting many charitable and cultural organizations. For example, in 1987, he headed the fund-raising campaign that enabled renovations to Victoria’s Theatre. 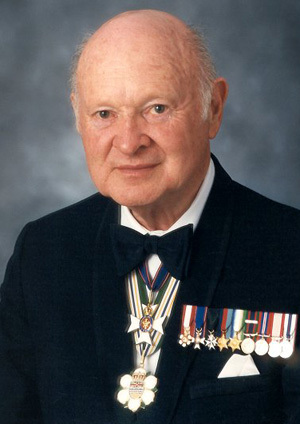 The list of Mr. Wallace’s honours is long; among them is the Order of Canada, an honorary degree from UBC, a Queen’s Jubilee Medal and the Canadian Centennial Medal. But the list of his involvement’s and accomplishments is much longer and stands as a testament to his great contribution to the life of this province.